A very beautiful Moss, found at Clifton, near Bristol in England in 1817 as a sport of the ‘Common Moss’. The large flowers are pure white, sometimes tinged with flesh and occasionally producing striped or pink petals. The buds, with long sepals, are exquisitely mossed, varying from bright green to soft brownish red. Dark green leaves and nice red prickles on young stems. 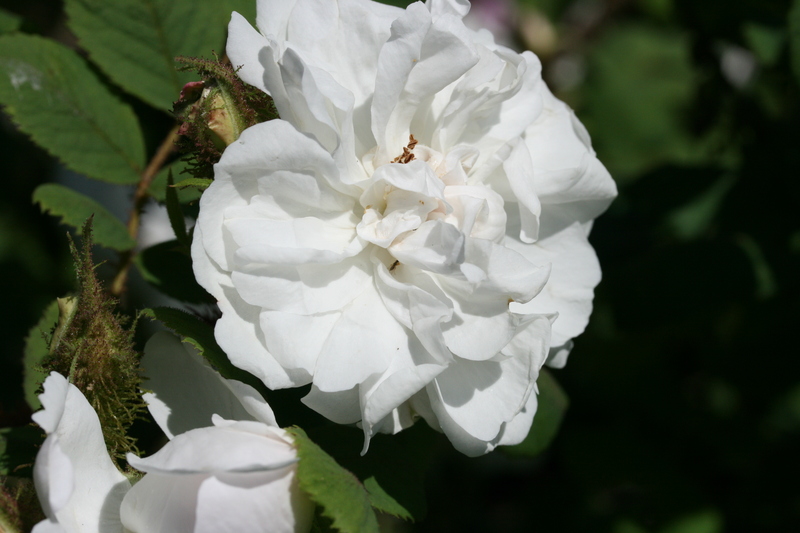 This rose is perhaps the best of the white Moss roses. “The singular coincidence of the two English White Moss Roses (both sports from the Common Red) having been discovered about, if not at the very same period, would appear incredible, did not the following particulars, derived from undoubted sources, for which I am indebted to Mr. Tiley, of Bath, nurseryman, prove such to be the fact. In or about the year 1799, the same year in which Shailer’s or the Unique White Moss was discovered, the nursery of the late Mr. Jonathan Salter, of Bath, a highly esteemed botanist and florist, was often visited by two ladies of the Society of Friends, for the purpose of purchasing bouquets. On one occasion, while Mr. Salter was cutting them some red Moss Roses, they enquired if he had ever seen a white one. With an incredulity which could only be equalled by a similar question being now asked as to a yellow Moss, he answered that not only had he never seen or heard of such a variety, but also expressed his disbelief of its existence. The ladies assured him that they had seen several blossoms of it, still he confessed that he must remain in doubt until he had not only seen but examined it; this they promised to enable him to do, and in the course of a week they returned, and presented him, much to his surprise and delight, with seven or eight blooms, fortunately with long stems, and from these he succeeded in propagating about two dozen plants that season. On his enquiring as to the origin of this beautiful Rose, the ladies informed him that they had not seen the plant, but that it grew against an old wall in a garden near their house in the north; it was an old plant of the Common Red Moss, a branch of which had forced itself through the decayed bricks, and bloomed very freely on the other side. The first year it was found the blossoms were pink and pinkish white, but the second season every flower became perfectly white. Mr. Salter having unfortunately neglected to enquire the locality of this, though not singular, yet strange sport, it is not known; but certainly the west, which is generally considered entitled to the honour, is not its birthplace. The recipient of this smile of fortune found his brother florists equally as incredulous as he himself had been as to the existence of this extraordinary novelty, and it was not until the plants had bloomed the following season that he could convince them of the fact. The stock remained in Mr. Salter’s hands the second season, and plants were charged a guinea for, when Mr. Miller, of Durdham Down Nurseries, near Clifton (now Messrs. Garaway, Mayes, and Co.), became the purchasers of a large part of the stock, and finding that Mr. Salter intended naming it the Bath White Moss, Mr. Miller preferred sending it out as the Clifton White Moss, and thus arose an alias which has puzzled many Rose growers to account for. Most amateurs are doubtless aware of the sporting inclination which this variety still retains, particularly when grown strongly; it will frequently come light pink, and one variety of the blush Moss was, we believe, thus obtained. Sometimes it has rose coloured stripes on the petals, and I once flowered it half white and half red; however, when growing in a situation congenial to its somewhat delicate habit, it must be acknowledged, from its retaining so much of the similitude of its parents’ beautiful calyx, that a bud of this Rose is one of the most recherche bridal flowers in existence.” [The Florist, Fruitist and Garden Miscellany, Magazine (1854) Pages 176-177].